Aside from the profundity of the spiritual experience, what impressed us both about the ceremony was the friendliness and informality of the priests: helping us syllable by syllable with the responses in unfamiliar Greek, showing us where to go, checking we were all right. They even allowed us to recite the Creed in English to make it more meaningful for us. All this was achieved without losing the underlying solemnity of the occasion. 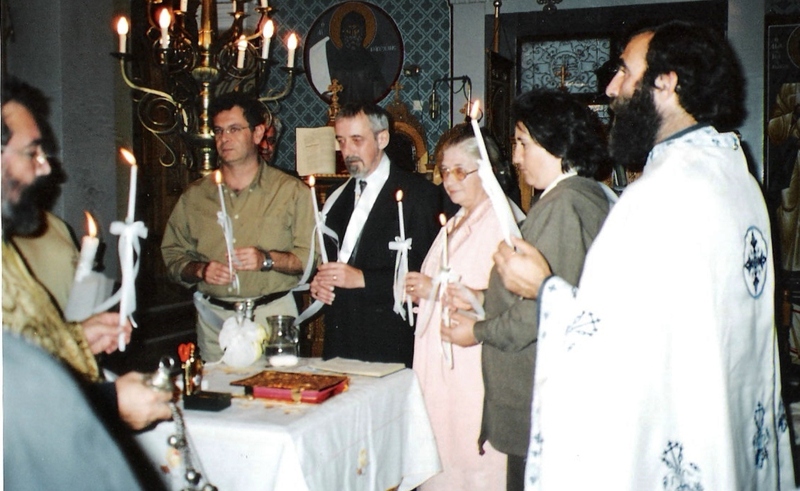 This is one of the great strengths of Orthodox worship in general, the services are reverent but not stuffy. I’ll never forget an open air service at a tiny church when the Bishop was in attendance. We had found a relatively shady spot with a very low stone step to sit on. When the bells began to ring we stood up but my wife had great difficulty getting to her feet. Suddenly, she felt a strong arm lifting her and turned to find that the Bishop had interrupted his solemn progress to help her. Would this happen in Rome or Canterbury? Is it heretical to think that God may have a sense of humour? Near where we lived at the time there was a little girl who always seemed to be in trouble. She was, I must admit, a bit of a brat and we were for ever telling her off for chasing our cats or other mischief. It is the tradition here that, during the baptism, the candle is held by the youngest child present in church and ours was held by the young sister of one of my students. However, it was proving too heavy for her little hands and our little ‘bête noire’ took over the job and held our baptismal candle for the rest of the service. I defy anybody to doubt that ‘the Boss’ was teaching us a gentle lesson in love and forgiveness. One of the ‘requirements’ of the newly baptized, including babies, is to take Holy Communion for the three Sundays following the service. All was well for the first Sunday, and we duly took our baptismal candles to our local church for the Divine Liturgy. On the second, however, we arrived at church to find it locked up. Not sure what was going on, we got in the car and drove to the church at the other end of the village – all locked up. Beginning to panic, we tried the church in the upper village which was also closed but fortunately an old lady in her garden pointed us further up the hill to the tiny church of St. Katherine, where all the priests were conducting a service for her feast day. Although a little late, we were in time to take communion and fulfil our obligation. The thought crossed my mind that, in my youth, I’ve driven round a town on a Saturday night trying to find a party but to drive all over Crete in search of a church service on a Sunday morning must be a first! All in all, we found our baptism service both a deep spiritual experience and a wonderful example of the love and kindness of the priests and local people. It even had its moments of humour. However, at the end of the service, as we heard the priest say “At this moment, you are sinless and among the saints. Try to keep it that way for as long as you can,” we felt that a major change in our spiritual lives had occurred.